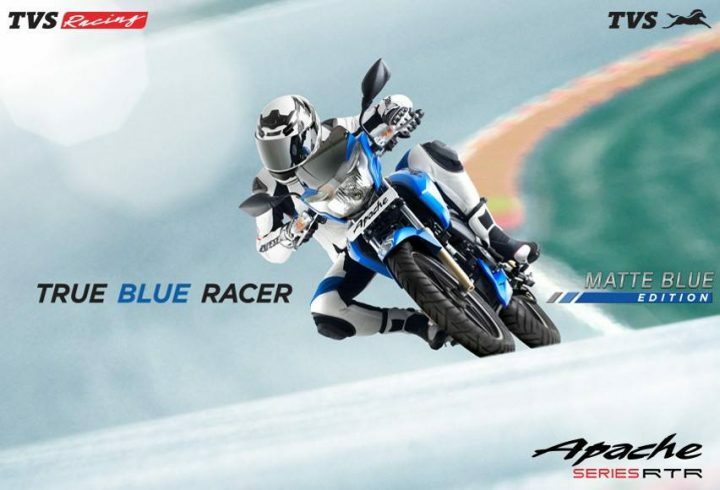 TVS Motor Company has introduced a new Matte Blue paint shade for the Apache series. The colour will be available in both the Apache 160 and Apache 180 guises. The Apache, although being a very competent and innovative bike, hasn’t kept the momentum going and unlike its rivals, hasn’t been able to step in the higher capacity segment. With brands like Yamaha, Bajaj, KTM and others, already touching the 300 cc mark in the bike market, TVS has been working with BMW and will launch a 310cc bike very soon. Also in the pipeline are new versions of the Apache series. The festive usually witnesses a slew of special edition launches and the Apache, in its latest Matte Blue avatar, is set to cash in on the rise in demand usually associated with the month-long festive season. 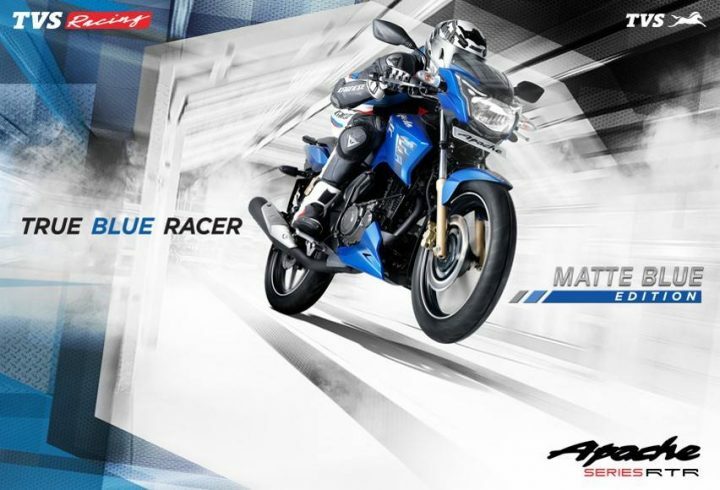 Read on to find all about the TVS Apache Matte Blue edition. Prices should not see much change and the Apache series should continue to cost somewhere between INR 72,000-83,000 (ex-showroom). The only addition made to the Apache RTR 160 and 180 is the new paint shade. The rest of the bike continues unaltered. The Apache RTR 180 is one of the meanest machines in its segment with its beast-inspired headlamp unit. The bike gets LED DRLs combined with the new pilot lamps to form a pair of intense animalistic eyes. The company claims that the bike gets a very masculine appearance with its muscled tank, tail cowl and engine cowl. Apart from contributing to its aggressive look, its aerodynamic tank cowl also improves the performance by keeping the engine heat 10 degree low. TVS apache RTR 180 comes with a sculpted digital display, which features nocturnal-blue backlit display, countdown-on-ignition speedometer and race-inspired carbon fibre touch-up. Powering the Apache 160 is a 159.7 cc air-cooled single-cylinder engine mated to a 5-speed gearbox. This unit produces 15.2 bhp @ 8,500 rpm and 13.1 Nm @ 4,000 rpm. A 177.4 cc air cooled single cylinder engine powers the Apache 180. Peak power stands at 17.03 bhp @ 8,500 rpm and peak torque stands at 15.5 Nm @ 6,500 rpm. This motor is also mated to a 5-speed gearbox. The bike comes equipped with a 270mm Roto-Petal disc brake at the front, while the rear gets a 200mm rotor. The company also offers ABS as an optional equipment with the bike, which costs around Rs. 10,300 extra. Its advanced front telescopic and spring loaded, Mono tube Inverted Gas filled (MIG) rear shox performs quite well with its braking system. With the recent alliance of BMW Motorrad and TVS Motors for coming up with a performance bike below 500 cc, due early next year, things are looking bright for TVS. We will keep you posted with further developments until then do let us know what your think of the TVS Apache Matte Blue edition.